This cover is made of genuine baseball glove leather with the impressed Major League Baseball silhouetted batter logo centered in the image of a baseball. Not available in Puerto Rico. This set of baseball themed checks has the baseball field and a baseball as the background. The checks have a red and white border. 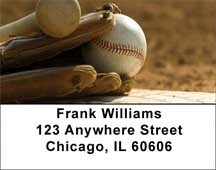 These labels have a baseball theme ranging from the baseball field to the baseball close up. The labels have a green and yellow border.